It is always a very great pleasure to see other people's models of Japanese aircraft and a privilege to be able to share them here. I confess a preference for both JAAF subjects and 1/72nd scale, especially those made from older kits, but Michael Driskill's prototype "George" from the superlative Tamiya kit is an attractive variation on the usual IJN colours so the whole package is a delight to see. The yellow colour is absolutely convincing and very well chosen in contrast to the very reddish oranges often seen on IJN prototype and trainer models. Michael's "Babs" is particularly sharp, depicting the later type in Army service and with a very subtle and convincing colour scheme - more details please! 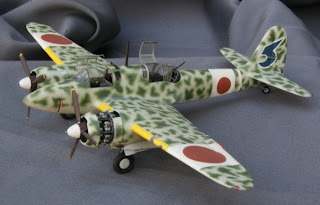 A good looking aircraft and deservedly popular with modellers, with the LS/Arii kit still available and a sound basis for the type. 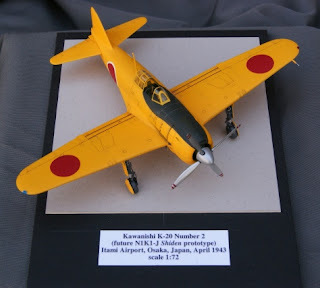 The "Nick", another of Michael's models is from the older Revell kit, one of a series of very fine Japanese twin-engine types produced in collaboration with Takara in Japan in about 1972. The other types were "Helen", "Sally", "Frances" and "Irving". 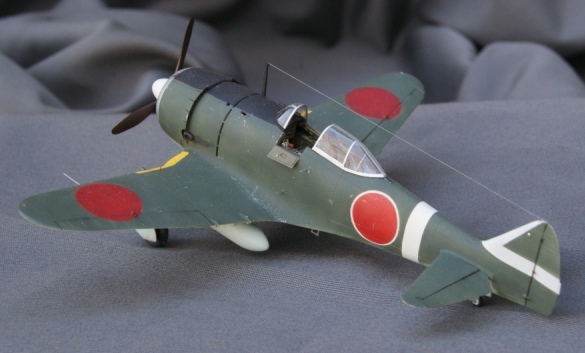 The quality and detail on these models was well ahead of its time and the kits ooze both inspiration and nostalgia, but where are the molds now? A mystery. Michael's model displays the kit at its best and it remains a respectable alternative to the more recent Hasegawa variants. 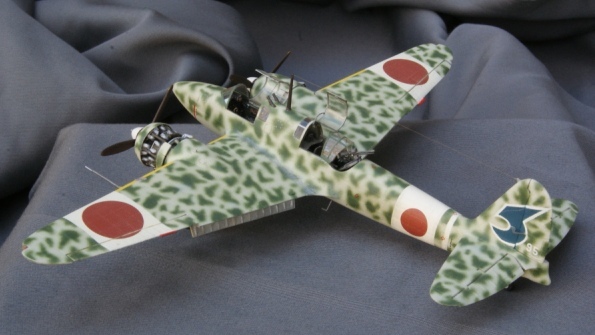 Hasegawa's "Tojo" remains the only 1/72nd kit of this type, model production being almost as limited as the real aircraft and perhaps reflecting the fact that not a single example has survived. Michael's model depicts a less well-known scheme from the 85th Sentai in China and shows just what a fine replica can be made from the kit. 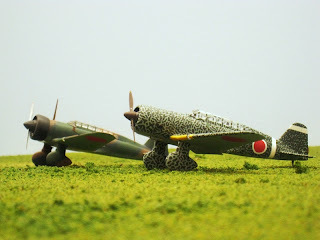 Very fine models all and thanks to Michael for contributing them. I hope we shall see more from him in future. "I was particularly interested in the picture of mottled Babs you posted on 9 October, and the picture of the same aircraft posted earlier. 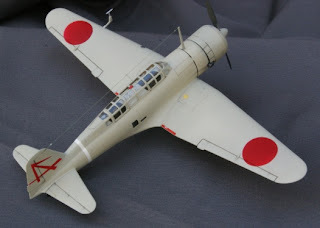 It is a fascinating aircraft. I found myself contemplating it on several occasions, to the point where I was inspired to order the old 1/72 scale LS kit and test my patience with the minute mottles. 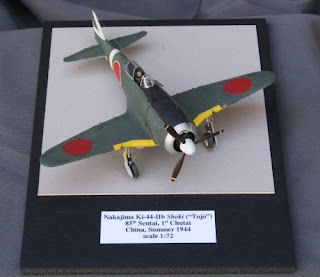 I had built the LS Ki-15-I kit many years ago. I have fond memories of that build, and 35 years or so after it’s initial release, the kit still does not disappoint! Finely recessed surface detail, good fit, nice shape, and razor-thin trailing surfaces are highlights. Cockpit detail is sparse, and some of the smaller bits are clunky, but those details are easily corrected. Despite it’s age, many manufacturers could still learn a trick or two from this kit! The build was very straight-forward. The kit provides a basic cockpit floor, seats, stick, and instrument panel, with some details for the decking. I built up the cockpit, mainly to prevent the see-though look. Keeping with the VIP transport / liaison hack premise, the observer’s “stool” was replaced with a bucket type seat. The kit supplied engine did not look the part, so I modified and wired a spare radial engine from an AMT Ju88 kit. The cowl flaps were thinned, flexed open a bit, and the exhausts drilled out. I also found the single central flap irresistible, so I dropped it and added ribbing from bits of Plastistruct. I am not imbued with any special insight when it comes to determining colors from black and white photographs. 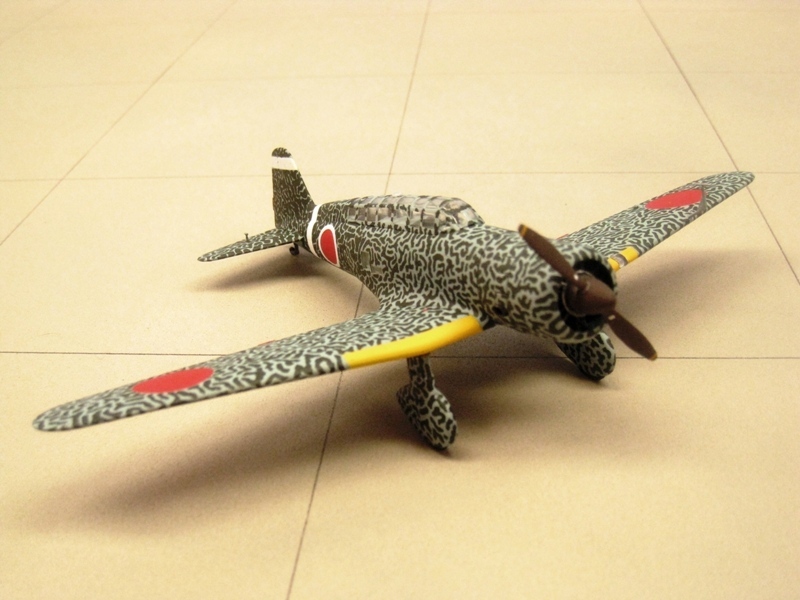 In this case, the tail markings are also subject to guesswork. After checking references, I thought a base color of A4 light blue gray with (field applied?) mottles of A1 was defensible, although a case can certainly be made for others combinations. Likewise, I chose a white stripe on the vertical stabilizer, although a white tip could also be argued, and yellow leading-edge stripes. 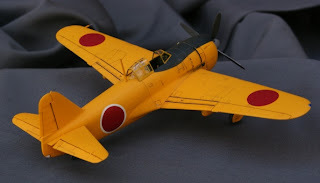 I masked off all the stripes and painted the base coat of A4 using Tamiya XF23 mixed with light gray, then applied Techmod Hinomaru decals. The overall A4 scheme is quite pleasing, but I resisted the temptation to stop with that. 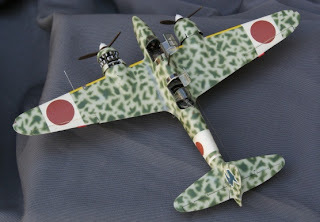 The mottling took over five hours, using Tamiya XF27 black green. One note, the mottle appears more dense aft of the observer’s fuselage windows, especially in the picture with the gentlemen posing. Perhaps the work of two painters? A few other points to mention. The prominent radio mast forward of the canopy is missing in the photographs, so I left it off of my build. It certainly could have been present when the aircraft was serviceable. Also, Ki-15’s had an intricate pitot tube assembly, and there are several variations. The kit provides two choices, both very clunky. I fabricated a wire replacement using the taller pattern, but the pictures do not show which was used on this aircraft. 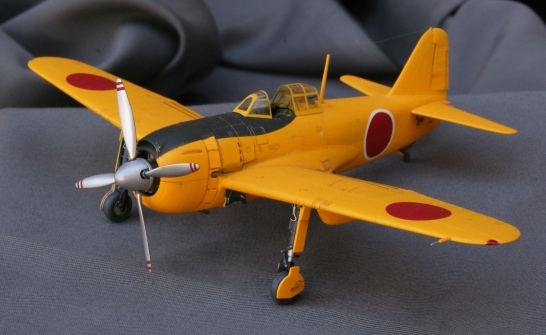 A very enjoyable build, and I would welcome any additional information on this aircraft." Jeff's build was inspired but serves in turn to inspire and his enthusiasm permeates throughout his description of the project. Genuine enthusiasm for the subject is always revealed, and rewarded, in the models themselves and invariably transcends all the old arguments. Thanks for sharing that enthusiasm here. I would love to see some more images of that older model "Babs" in the background too! 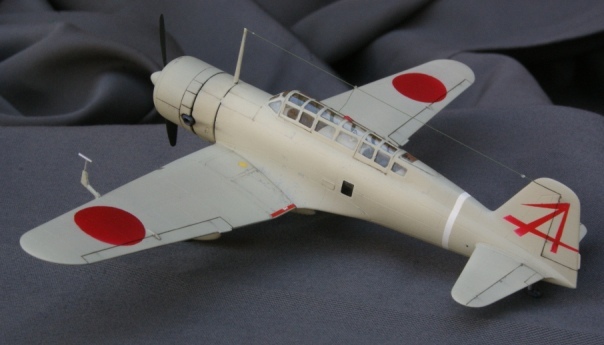 Please do continue to send in photographs of your Japanese aircraft builds. All are appreciated, however long they might take to appear (!) and here they will find a more permanent and welcome home than on forums where they often "disappear" after a day or two. 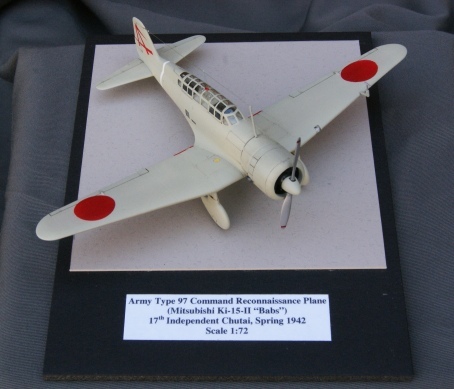 Japanese aircraft enthusiasts from all over the world are continuing to discover this blog for the first time and to enjoy trawling through the archived posts, but especially to be able to view the inspiring images of the models "preserved" here. Corrected the "Kiroff" rendered chip in the second schematic of RLM 02 colours here (top row, left hand chip). It was rendered with the incorrect sRGB values. If you have downloaded and saved this schematic please replace it. The sRGB values in the table were/are correct. Excellent and inspiring work! Thanks for showing them off, Nick. NICK--I don't want to give away my age but let's just say the old "blue cover" FAOW's were the best references available when it was built! No one had yet thought about the internet... The color scheme is based on a FAOW profile and I think most aspects of the model would hold up fairly well under modern eyes. All extra detailing on the model is scratch built. TOJO--Much the same comments apply. The color scheme was based on a poor photo and one would have to say a fair amount of artistic license is involved! 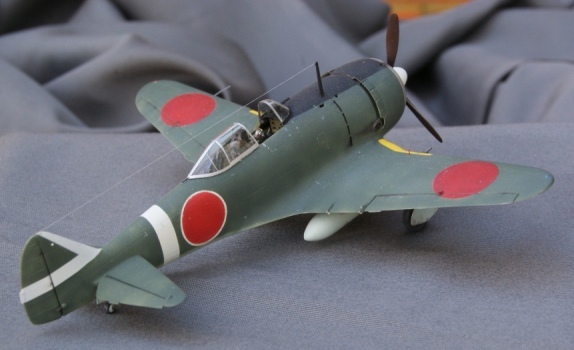 This is a beautifully-molded old kit but we sure do need a new kit of the Ki-44 up to modern standards of accuracy and detail. GEORGE--just did this one a couple of years ago. I really feel the Aoshima kits of the N1K1-J series are more accurate, but Tamiya certainly scores in detail and buildability. It was a fun and fairly easy build. BABS--brand new! I mixed the camo color on this one with much help from this site and j-aircraft. 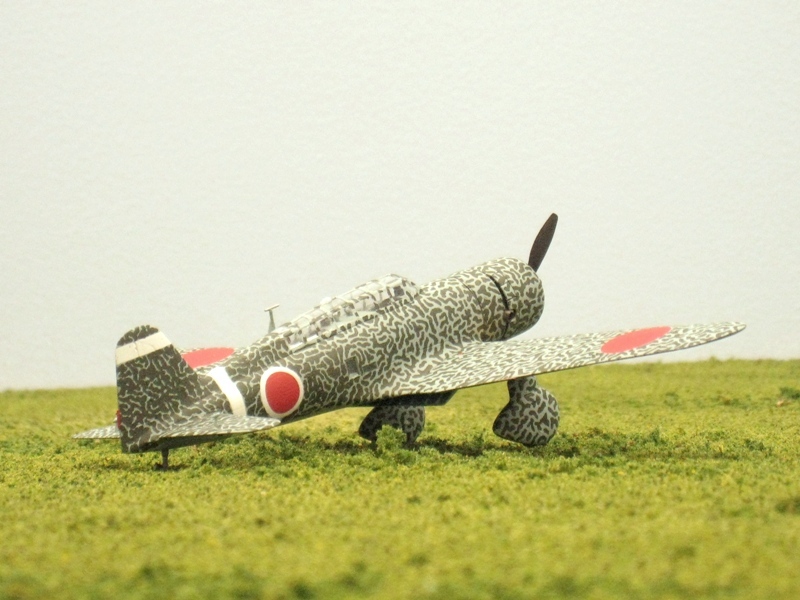 It is built to IPMS/USA "out of the box" rules so has minimal added detail. These old LS kits are really quite nice. I admire the way they did all the variants of this fairly obscure machine, and I'd like to build the rest of the "family" someday. Great work with your kits, Mike.